I’ll be set up at the Son of Monsterpalooza show in Burbank, CA October 26-28 with a mostly masked-wrestler themed table full of vintage toys, back issues and merch and of course the NEW BOOK! 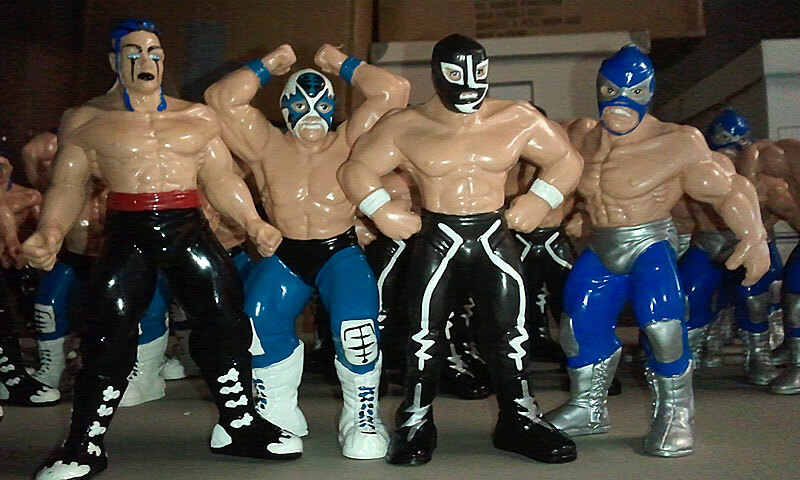 I’ll have a limited inventory of these superb 5″ vinyl figures done back in the mid-90s by San Francisco Toymakers of CMLL stars Rayo de Jalisco, Lizmark, Atlantis and Vampiro Canadiense (sorry, no Pierroths or the elusive Ultimo Dragon). Plenty of other rarities from the FPU archives as well. Come on down, it’s an amazing show and there is literally no better place on earth for admiring Hollywood special effects creators both classic and contemporary. George ‘The Animal’ Steele is on the guest list, too!!! Hi hello, im interested in buying wrestling toys and i cant find your contact anywhere in the site, let me know what do you have available? Contact link is right on the left side of the site, plus we’re on Facebook and Twitter. Nothing for sale right now but if the schedule holds by the late Fall we’ll be posting some gems from the collection — some Marmit and Marusan figs from Japan, old San Francisco Toymakers CMLL stock, and some other one-offs from Mexico.